Professor David Bellamy, the world-famous botanist, needs no introduction but this page has a link to a website for those who might like to learn more.about him. 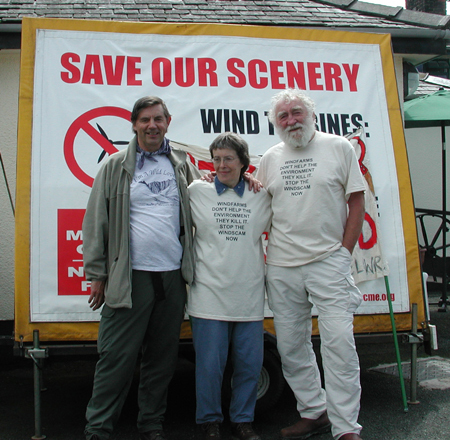 Both of the Davids took part in the protest march on Mynydd y Gwair (summer 2004) which you can see on the SOCME website. I didn`t know much about wind farms when that happened then, and I am very honoured to have been asked to join them in leading this demonstration. (Just in case anyone is interested in Devon as well, I have an Exhibition currently running on my own artists website, about a walk I did round the wind farms sites of Devon last year).